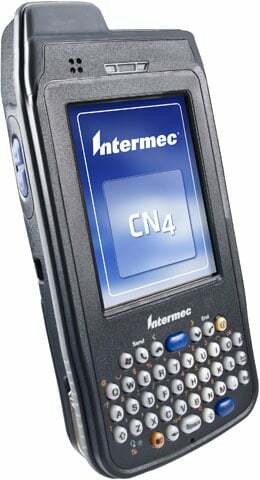 Intermec CN4 - Windows Mobile 6.1, 128MB RAM, 256MB ROM, SmartSystems, 802.11 b/g and Bluetooth, WWAN GSM/GPRS/EDGE/UMTS/HSDPA, GPS, QWERTY keypad, Area Imager. Battery, charging and communications cradle, cables and power supply not included. See accessories. With integrated 3.5G wireless technology, the fully rugged and feature-rich Intermec CN4 mobile computers enable enterprises operating in the most demanding environments to leverage the benefits of high bandwidth data collection and communication to achieve gains in worker productivity, improvements and expansion in their service offering, and reductions in overhead. The CN4 is not only the most rugged devices in their class with IP64 sealing and a 1.8m (6 ft) drop spec, but also have field-proven, built-in software support for a broad range of compatible peripherals designed to serve a broad range of applications in the transportation, field service and direct-store-delivery environments. The Intermec CN4AQJ801U1E800 is also known as Intermec Technologies	INT-CN4A02	.